Purpose: To evaluate the antimicrobial and resistance-reversal activities of seven phenothiazine derivatives against one standard methicillin-sensitive and ten methicillin-resistant Staphylococcus aureus (MRSA) strains originating from human infections. 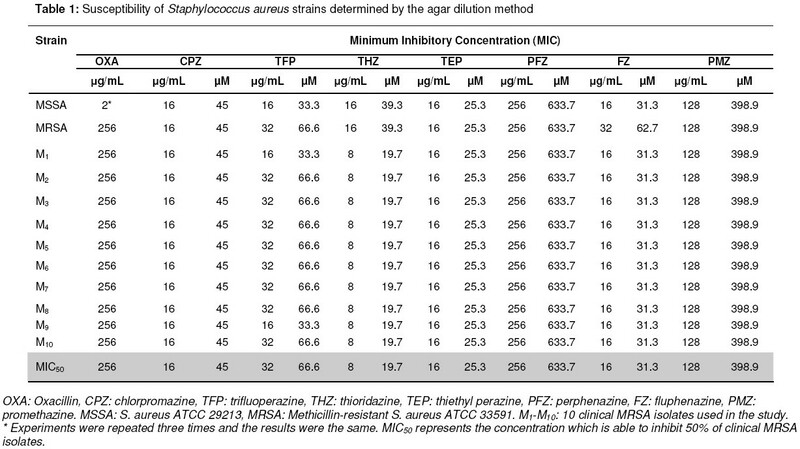 Methods: Minimum inhibitory concentrations (MIC) of the compounds were determined by agar dilution method, and synergy between phenothiazines and oxacillin was investigated using Checkerboard (microbroth dilution) technique. Results: We found that all S. aureus strains, regardless of their susceptibility to oxacillin, were inhibited by phenothiazines at a concentration of 8 - 256 μg/mL, with thioridazine being the most potent inhibitory agent. Phenothiazines at sub-inhibitory concentrations lowered the MIC of oxacillin from 256 to 2 μg/mL, which is a clinically significant level. The highest number of synergistic combinations, i.e., fractional inhibitory concentration (FIC) index less than 0.5, was seen with chlorpromazine and perphenazine. However, thioridazine reversed antibiotic resistance at a concentration as low as 4 μg/mL. Conclusion: Although synergy was observed at concentrations higher than those that phenothiazines usually attain in vivo, the potential offered by non-antibiotics justifies further animal experiments as well as clinical trials to establish their clinical relevance. Antibiotics and antimicrobial chemothera-peutics exist in large numbers in today′s pharmaceutical market. This notwithstanding, their use is becoming increasingly restricted due largely to the development of drug resistance among microorganisms coupled with the toxicity of several antimicrobials. This has necessitated the search for newer antimicrobial agents that would overcome these drawbacks. Several compounds belonging to various pharmacological classes possess moderate to powerful antibacterial activity. Such compounds, which possess antimicrobial properties in addition to their predesignated pharmacological actions, have been called the ′Non-antibiotics′  . The antimicrobial activity of synthetic and non-chemotherapeutic compounds such as methylene blue has been known since the days of Ehrlich (1854 - 1915). Phenothiazines are dopamine receptor agonists which are used clinically as antihistaminic agents or neuroleptics for the management of psychosis and have been shown to have modest antimicrobial activities against a wide array of microorganisms when combined at one-fourth of their MICs  . With common antimicrobial substrates of multi-drug resistance (MDR) pumps of Staphylococcus aureus, phenothiazines augmented the antimicrobial activities of these substrates  . In this regard, phenothiazines could be used as adjuncts to antibiotics where resistance has been observed  . In this study, the antimicrobial effects of seven phenothiazines and their possible synergy with oxacillin against clinical MRSA isolates were investigated. The 10 methicillin-resistant Staphylococcus aureus (MRSA) strains used in this study were obtained from routine specimens at Milad Hospital of Tehran, Iran, and were designated as M 1 - M 10 . In addition, methicillin-sensitive S. aureus (MSSA) ATCC 29213 (mecA - ) and MRSA ATCC 33591 (mec A+) were procured form Mast Group Ltd, Merseyside, UK and used as standard strains. All bacteria were preserved both in deep frozen state and at 4 ºC in slant agar. Oxacillin (as sodium salt) was purchased from Sigma, St. Louis, USA. The phenothiazines used - chlorpromazine, trifluoperazine HCl, thioridazine HCl, perphe-nazine, fluphenazine HCl, promethazine and thiethylperazine maleate - manufactured by Aventis Pharma, Industrial Chimica Milanesa, Trifarma, Industrial Chimica Milanesa, Fine Chemicals Corporation, Egis Pharmaceu-ticals Ltd and Novartis, respectively. These drugs were provided free of charge by their local subsidiaries in Iran. All the agents were stored at 4 ºC over silica gel and used as received. Mueller Hinton agar (MHA), Mueller-Hinton broth (MHB) and trypticase soy agar (TSA) media were obtained from Merck Co, Germany. All other materials were of analytical grade. The agar dilution method recommended by the Clinical and Laboratory Standards Institute (CLSI) was employed to determine the MIC of antimicrobial agents  . Oxacillin was dissolved in sterile distilled water, filter-sterilized and then added to molten MHA containing 2 % NaCl at concentrations of 0.5 to 1024 μg/mL. It was then poured into sterile Petri dishes under aseptic conditions and maintained at pH 7.2 - 7.4. The phenothiazines, except perphe-nazine and thiethylperazine, were also dissolved in sterile distilled water and filter-sterilized. Perphenazine was dissolved in dimethyl sulfoxide (DMSO) and thiethylperazine in methanol together with a few drops of ammonia. The phenothiazine solutions were finally added to molten MHA to make final concentrations of 2 to 1024 μg/mL, and treated as described above for oxacillin. Bacterial strains were grown in TSA at 35 ± 0.5 ºC for 20-24 h. From these cultures, the organisms were directly suspended in 5 mL of sterile saline solution (NaCl 0.9 %w/v). The turbidity of each suspension was adjusted to 0.5 McFarland standard using a spectrophotometer (Milton-Roy Spectronic 601, USA) at 625 nm, corresponding to ca. 1Χ10 8 colony-forming units (CFU)/mL. The suspension was further diluted 1:10 with sterile saline solution. A 2-μL aliquot of each suspension was applied to MHA plates containing increasing amounts of the drug so as to obtain ca . 10 4 CFU/spot. The plates were incubated at 35 ± 0.5 ºC and examined for the appearance of growth after 24 h, extended up to 72 h where necessary. MIC was recorded as the lowest concentration of antimicrobial agent that completely inhibited growth, disregarding a single colony or a faint haze caused by the inoculum. Presence of synergy and its degree was confirmed by Checkerboard method with microtiter trays using cation-adjusted Mueller-Hinton broth (CAMHB) as described elsewhere  . Oxacillin was tested at concentrations of 1 to 512 μg/mL, and phenothiazines at 0.625 to 512 μg/mL. The trays were prepared and kept for a maximum of one week at -20 ºC before use. Oxacillin was dispensed alone in the first row, and phenothiazine was dispensed in the first column. To each well, 6 μL of an inoculum of ca. 10 7 CFU/mL was added to make a final concentration of ca. 10 5 CFU/mL. The trays were incubated aerobically at 35 ± 0.5 ºC for 24 h. For each run, ATCC reference strains served as control. Cultures that contained neither a phenothiazine nor antibiotic served as growth control. MIC was read as the lowest concentration of antimicrobial agents showing no visible growth or only a faint haze. MICs were determined for each agent individually and in combination. All determinations were repeated three times. For clinical isolates, MIC 50 was determined, which is the minimum concentration inhibiting 50 % of isolates. Synergy was determined by calculating the fractional inhibitory concentration (FIC) index as in Eq 1.
where [A] is the inhibitory concentration of the organism to drug A when combined with B, MIC A is the MIC of the organism to drug A alone, FIC A is the FIC of drug A, and [B], MIC B , and FIC B are defined in the same fashion for drug B. FIC index was interpreted as follows: < 0.5, synergy; 0.50 - 0.75, partial synergy; 0.76 - 1.0, additive effect; > 1.0 - 4.0, indifference; and > 4.0, antagonism  . For clinical isolates, median FICs were calculated using SPSS 17.0 software (SPSS Inc., USA). 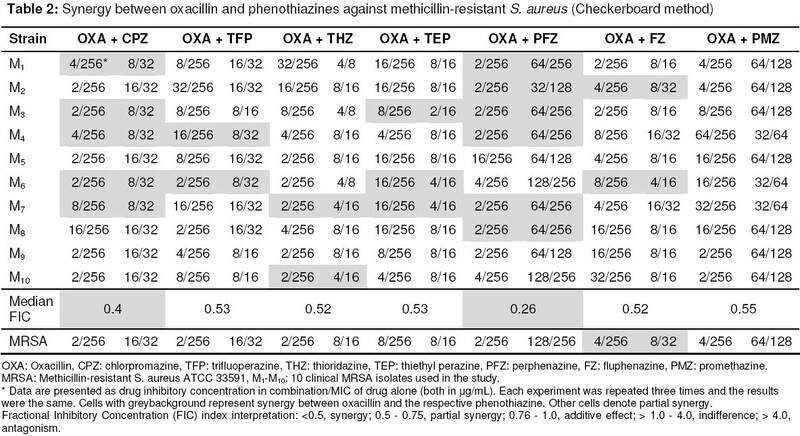 The MICs of test strains to oxacillin and phenothiazines are presented in [Table - 1]. Oxacillin inhibited MSSA ATCC 29213 and MRSA ATCC 33591 at 2 μg/mL and 256 μg/mL, respectively, which are within the reference range for these control strains. This antibiotic also inhibited all clinical isolates of MRSA at 256 μg/mL. All the phenothiazines inhibited the growth of MSSA and MRSA strains, with thioridazine being the most potent inhibitory agent. MRSA isolates were either highly sensitive (< 50 μg/mL) or moderately sensitive (50 - 400 μg/mL) to the phenothiazines. The phenothiazines inhibited S. aureus strains regardless of their susceptibility status to oxacillin. The degree of synergy between oxacillin and the phenothiazines against the MRSA isolates, determined by Checkerboard technique, are shown in [Table - 2]. Various combinations of oxacillin with phenothiazines inhibited most of the MRSA strains at concentrations well below their minimum inhibitory concentrations. This inhibitory effect was significantly expressed (synergistic or partially synergistic). The highest number of synergistic combinations (FIC < 0.5) were seen with chlorpromazine and perphenazine. Surprisingly, perphenazine remarkably potentiated the effect of oxacillin against MRSA isolates in spite of its rather high MIC when used alone (256 μg/mL). However, thioridazine also reversed antibiotic resistance at a concentration as low as 4 μg/mL. In contrast, no significant synergy was observed for combinations of oxacillin and promethazine. In some cases, phenol-thiazines reduced the MIC of oxacillin to a clinically significant level, i.e., 2 μg/mL. The antimicrobial activity of phenothiazines has been known since the time of Ehrlich (1891)  ; nevertheless, enhancement of the activity of conventional antibiotics by these and other compounds has only recently been a subject of interest. To the best of our knowledge, phenothiazines such as thiethylperazine have not previously been evaluated for their antibiotic resistance-modifying activity. This investigation was carried out in two steps. First, the MIC of the drugs was determined by agar dilution method. The MICs obtained for MSSA ATCC 29213 and MRSA isolates were 2 μg/mL and 256 μg/mL, respectively, confirming both the accuracy of the method and resistance of the clinical isolates based on CLSI guidelines  . On the other hand, the results implied high (MIC < 50 μg/mL) to moderate (50 - 400 μg/mL) activity of phenothiazines against the MRSA isolates  . The MICs obtained for chlorpromazine, trifluoperazine, thioridazine and promethazine are consistent with those reported previously ,, . The antibacterial potency of the drugs was not linked to their other pharmacologic activities, and this is in agreement with results of earlier investigations  . To understand the stoichiometric relationship between the phenothiazines and their antibacterial activity, their potency was calculated on the basis of their molar concentration. Yet, their antibacterial activity in micromolar (μM) concentrations was comparable to that in μg/mL. Furthermore, the results show that phenothiazines have an antimicrobial effect against S. aureus strains regardless of their resistance pattern to oxacillin. A similar finding was also reported for S. aureus using the combination of chlorpromazine and thioridazine  . This may be attributed to of the fact that these non-antibiotics and oxacillin exert their activities at different sites. Phenothiazines inhibit enzyme systems which are dependent upon Ca 2+ , such as those involved in generating cellular energy from hydrolysis of ATP, by preventing the transport of calcium (Ca 2+ ) through Ca 2+-binding proteins such as calmodulin  . Among these phenothiazine-sensitive systems are transporters that extrude from the cell a variety of harmful agents such as antibiotics and hence protect the cell from these agents  . Steady state plasma concentrations of chlorpromazine, fluphenazine, promethazine, thioridazine, trifluoperazine and perphenazine have already been found to be 0.002 - 0.12, 0.002 - 0.004, 0.002 - 0.018, 0.05 - 0.5, 0.001 - 0.004 and 0.0003 - 0.025 μg/mL, respectively  . Our in vitro findings revealed that phenothiazines inhibited MRSA isolates at concentrations which are well beyond their plasma concentrations. However, phenothiazines such as thioridazine are concentrated as much as 100-fold by macrophages  . Killing of phagocytosed S. aureus, an intracellular infection of the human macrophage, by non-killing macrophages is enhanced by concentrations of thioridazine that are well below those employed for the therapy of psychoses  . Additionally, in vivo experiments with Swiss mice have demonstrated the potential antibacterial activity of these compounds  . In the next step, synergy between oxacillin and phenothiazines were investigated by Checkerboard technique. The results showed that susceptibility of MRSA strains to oxacillin was significantly affected by the phenothiazines, particularly chlorpromazine and perphenazine. The reduction of oxacillin resistance from 256 to 2 μg/mL was identical for these two pheothiazines. These results are comparable to those of other researchers , , who found a reduction in MIC of oxacillin against MRSA when phenothiazines derivatives were added to the medium. The phenothiazines reduced oxacillin resistance to 1/2 or 1/4 of their MICs a phenomenon that was observed in a previous report  . Furthermore, thioridazine showed the most potent activity among phenothiazines, and modified oxacillin resistance at concentrations lower than those of other phenothiazines. Thioridazine, though has less severe side effects than chlorpromazine, has been shown to have cardiotoxic side effects and, as a result, was withdrawn in 2005. Still, thioridazine is of therapeutic interest since the (S)-enantiomer, (S)-thioridazine, is less toxic  and a more effective potentiator of antibiotics than the other thioridazine derivative, (R)-thioridazine  . Although this study did not address the mechanism(s) by which phenothiazines mitigate the resistance of MRSA strains to oxacillin, resistance of staphylococci to oxacillin is mediated by mecA, an ′acquired′ gene that encodes a variant (PBP2a) of penicillin-binding protein (PBP2) and which has low affinity for all beta-lactams. Transposon inactivation of the structural gene of the S. aureus PBP2 of a highly methicillin-resistant strain resulted in a reduction of methicillin resistance from 800 to 12 μg/mL though normal amounts of PBP2a were produced by this transposon mutant  . This massive reduction of methicillin resistance was recently shown to involve the deactivation of the transglycolase domain of PBP2 and not its transpeptidase domain  . It is tempting to suggest that the similar reduction of oxacillin resistance from 256 to 2 μg/mL found in our work may be mostly due to such deactivation by phenothiazines such as chlorpromazine, in that this compound is well known to deactivate a large number of enzymes  . Moreover, the addition of the combinations of neurotropic drugs and o-lactam oxacillin led to lower levels of specific RNAs and proteins, indicating their interference with DNA-based processes  . Thioridazine also induces ultra-structural changes in MRSA such as alteration of the structure of the cell envelope, resulting in bacterial lysis at clinically relevant concentrations  . Phenothiazines, including thiethylperazine, can significantly reduce the resistance of MRSA strains to oxacillin in vitro. However, further investigations are necessary to elaborate the mechanism through which phenothiazines exert this resistance-modifying effect. Finally, the question of whether the concentrations of phenothiazines that are effective in vitro against phagocytosed staphylococci are rendered less effective in vivo by physiologically limiting parameters such as proteins binding of the drugs or their conversion to inactive metabolites produced by the liver, must be answered, and therefore, should be a subject of further study before consideration of the compound for clinical trial. Although synergy was observed at concentrations higher than those that phenothiazines reach to in vivo, the potential offered by non-antibiotics corroborate further animal experiments as well as clinical trials to establish their clinical relevance. This study was supported by Grant no. 1048 from Shahid Beheshti University of Medical Sciences. We express our best gratitude to Tehran Chemie, Chemidarou, Pars Minoo and Darou Pakhsh pharmaceutical companies for providing us with phenothiazines.